Think out-of-the-box planning your next event with RythmTrail Caribbean steel drum band! 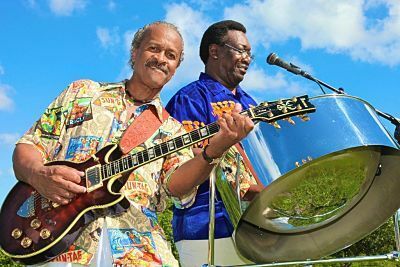 From beach weddings to rehearsal dinners, corporate events to house parties, and birthday parties to anniversaries, treat yourself and your guests to the smooth sounds of one of the best steel drum bands in the world. All of our steel drum players are native Caribbean islanders, and we’ve been helping people in Clermont FL. like you throw the ultimate events for over 20 years. Let us entertain you with our steel drum music, Soca, Calypso, and Reggae jams to take your event from ordinary to extraordinary. Don’t need our full band? Then try a solo performance by one of our steel drum players, perfect for more intimate settings or smaller venues. For events large and small, our skills cover it all. Don’t feel limited to Clermont, though. Our steel drum band plays all over, from up and down Florida, to across the country, even globally. Whatever and wherever your needs, count on RythmTrail. Why gamble on professionalism and quality for your special day, when we’re just a phone call away? Whether you need upbeat, energetic music for your next big house party, or romantic melodies for an anniversary, escape to another world with the sounds of our steel drums. Know exactly what you need? Give us a playlist of all your favorite tunes, and we’ll take it from there. If not, we know exactly what to do to keep your event going strong or your ceremony lively. If you’re ready to book the sounds of the Caribbean at your next big event, call us at 866-495-4522 or get a free quote from us online. Let’s work together to turn your next event into a tropical paradise, but don’t delay! Our schedule fills up fast!